Yesterday was a day of transition. I was debating the thought of fishing and would have decided pretty quickly if not for the weather. Monday we had recieved some rainfall and depending where it was anything from substantial to just minimal. The temps had dropped overnight and the winds picked up big time with gusts to 45mph. So I rolled the fly box and it came up "GO". The gear was put in the car and off I went. Old dry leaves still hanging on. A few steps away and signs of transition...green starting to take hold. Water conditions were perfect. Clear, cold and a flow that could afford the angler a chance to get close. A "Bomber Brookie"...the dry fly was very effective today. Is there any doubt that there is a trout in here? Here is the answer. This beautiful wild jewel came up twice to get the fly. I was thankful he succeeded on the second try. Over the course of 30 years I have enjoyed the annual trips to western mountains of Maine. The one area known as the Rangeley Lakes region. This vast region encompasses so many square miles of pristine waters, both streams, rivers and huge lakes. The area also is a wilderness with some of the most majestic animals in the northeast United States. We have stayed at a rustic cabin on the shores of Rangeley lake as well as Mooeslookmeguntic lake. In the evenings one can hear loons calling, their sound is both lonely as well as the comforting sound of the wilderness. Moose in the fall bellow, looking for a mate. The coyote seems always present, and the black bear just keeps wandering never stepping on the same piece of earth in its lifetime. Waters that team with salmon and brook trout. Maine has the most wild brook trout water in the east, it's natural range. To cast a fly in these waters is to join many others before you, and perhaps you might be the first. Waters where fly fishing is king. Places where the Gray Ghost was created. Names like Herb Welch, Bill Edson and Bert Quimby....the Black Ghost, the Edson Tiger and the Green Ghost, just to name a few. Familiar names here...Magalloway, Oquossoc, Steep Bank, Little Kennebago, Upper Dam, Pond in the River, South Bog, Richardson, a little stream that flows off Potato Nubble, Dead River and so many more. I have fished many of these waters, but I have a favorite. I have cast caddis and ghosts in this stream with equal success. I have fished it from it's source to it's meeting with the big lake. I have loved it in the early morning as the light filtered through the trees, and as the days last specks of light said goodnight. I love you Rangeley...see you in September. Somewhere along the way I read an article about a certain tree and brook trout. The article stated that where you find the hemlock tree you'll find wild brook trout. That article made an impression on me and that still holds firmly today. In the top photo is a stream I fished the other day, as you see there is an abundance of hemlocks some of which are quite impressive in size. Well the stream was also impressive in the amount of brook trout present. Here you see a spool of thread, a hook, and feathers, not very impressive. When put together they become something impressionistic. The fly created by the scant few materials does not represent any one type of insect in the stream, but does represent many. Its size, overall color, and movement by the hackles tell the trout I'm food. 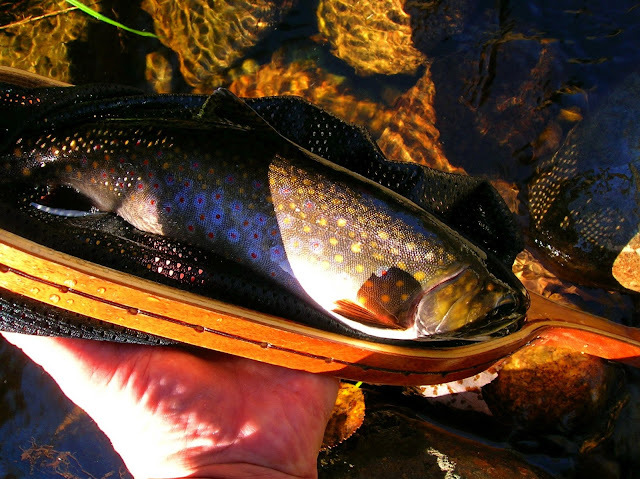 On this day the brook trout found the impressionistic fly to be impressive, and it left an impression on me. As I fished a small stream Sunday, while seemingly stopped in time for some moments I realized, or should I say brought that realization forefront while standing near some of the most pristine of waters, waters so pure and clear they almost are not there. It became quite clear in my mind that the reason for the beauty of this place and the wild jewels that call it home is the water. In the series of photos I'll try to show you this beauty as it cascades over countless obstacles on it's journey to the sea. In the pools and riffles of this stream I found a few willing brook trout. They were gracious to rise to a dry fly. It's so simple my friends....all that's needed is clean cold flowing waters. A post about my last few outings. The weather was great, somewhat chilly, but this is March. The stream has been hot on and painfully slow, I guess the trout can be finicky even in a small stream. On a couple of trips I had the company of like minded anglers, both Pete aka TROUTI and Kirk aka FSH NUT have had success and that makes it all good. This stream holds wild brook trout and browns but the catch has been all browns for me. Well the calendar says it's the first day of Spring, only it's going to snow at some point today...oh well New England. Maybe a few hours of fishing today, then home to a plate of spaghetti. Handsome. They can put a bend in a glass rod. Pete...a quick snap and release. Nice brown. This fellow took a soft-hackle dry. Who in the hell could cast a fly in here? I know who. Not only cast in there but also come out with a brown on the fly. Nice outing gents. The North Country Fly is the epitome of simplicity. Most can be constructed with as few as three materials and be trout takers to the top level. The patterns tied here will show the simplicity of those three materials plus one. The patterns naturally have a hook, be it one of the materials but also a body material usually thread which can be silk or a blend of various fiber be it natural or synthetic, and hackle. In addition I have included a dubbing material. The dubbing is very sparse, and sometimes even less than sparse as you will see. 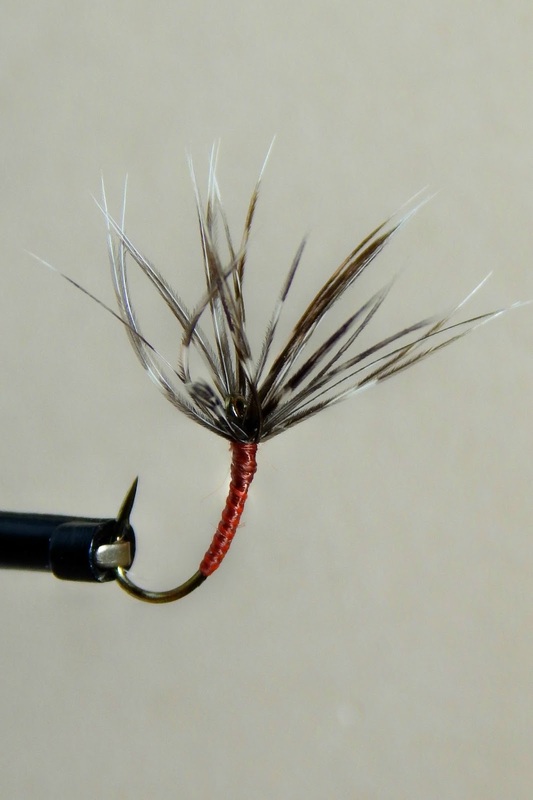 In his book "The North Country Fly" Robert L Smith mentions the word "buzz" when talking of the subtle movement of the hackle in the various currents of streams and rivers. This movement represents a natural insects struggle to free itself of the current which is trying to hamper it. With this thought I also add a scant amount of dubbing to the thread and a life like body is obtained. The fibers allow the thread to show through giving a translucent effect to the fly as would be the case of the natural insect. Those fiber also allow for more subtle movement which make the fly effective. This fly has a body of gray thread, and a few touches of gray dubbing and light hackle. On this fly a primrose silk body, with yellow dubbing and partridge hackle. This very seductive looking fly has a yellow silk thread body, a bit of natural hares dubbing, and a bleached starling hackle. This last fly uses a green thread body, a peacock herl thorax, the peacock will act as the "buzz" and the hackle is grizzly hen. Having fished a stream last week I was determined to follow up on it's potential of being one of those really special streams that lock a place down in your memory. Yesterday I drove to that stream thinking how much nicer today was going to be instead of the rain out I faced on Thursday of last week. The sun was promised to appear, the temp were to be mild and no wind. I reached the road where I would park and geared up. While walking to the access point I saw a tributary to the stream I was going to fish. Many of these streams are seasonal, in other words they dry up as the warmer weather begins to take hold. It looked so inviting I said to myself give it a shot. So I pushed through that first clump of tangled briars and made way to the little brook. The first thing I noticed was the abundance of stoneflies. They were every where. At one point I had several on my jacket as well as my rod. This seemed to tell me perhaps this stream runs like this all year and not just in the Spring. In the tails of pools as this I drifted wet flies. It did not take long and I was into a brook trout. What a beautiful specimen. Bright and feisty. As I walked the stream I noticed the terrain around me was changing, there were some very big boulders, and the little stream I was fishing was suddenly running through a very deep valley. I knew I would be OK as long as I stayed close to the water, and that is what I did. In the slack water I noticed several fish rising. They seemed to be just breaking the surface. I tied on a Bomber and soon managed to take several brookies. The stream while not very deep had those places where you might find a fish that could be persuaded to take a streamer and the place above is one of them. The yellow-orange streamer did find this willing fellow. I continued my exploration of this wonderful stream. Watching for rising fish and just enjoying what was before me. I fished for many hours catching and letting go some of this worlds most beautiful wild jewels. With something like this to behold your day cannot be any better. Yesterday I paid a visit to a stream I first set eyes to several weeks ago. On that day it was cold and blustery with ice and snow still in force. Marking some good looking spots I was determined to come back. I reached the stream about 10 am, later than I wanted, the reason being I went left instead of right and had to drive a long way to get back to where I wanted to be. The stream is located in the Berkshires of Massachusetts and in places has a pretty steep gradient. The pools were deep and some of the runs were impressive, and looking at it you knew it had brook trout. There is a special kind of anticipation when one casts a fly on new waters, a feeling of opening a gift at Christmas. On the third cast I had a hit. Two or three casts later another hit. Finally I had my first hook-up. This little guy was responsible for those hits "tenacious" indeed. This was the size trout I had taking my flies, he was one of many, many. The stream was to nice to only hold small brookies. There had to be bigger fish somewhere. There was and I got a few of them to take. Look at all those hemlocks. I started taking brookies like this. "Kiwi" look at that fly. I had a big brookie swipe a streamer alongside of that boulder, I will try for him another day. My outing was cut short because of rain. I only fished a small section of stream and I have much more to explore.